I don't like to write bad words about a company without a real need to, but I feel I wouldn't be telling the truth if I didn't do so. We haven't had the best luck when employing tradesman, perhaps I'm just super picky, perhaps my expectations are too high, possibly unrealistic, or perhaps we are just simply unlucky. Back when we had the consumer unit fitted, I chose not to mention some of the negatives I felt towards the electrician on the day (other than that hideous isolation switch!). I wasn't sure if I was being fussy or just unfair. We chose to use this particular electrician partly due to our neighbour highly recommending him and partly due to his low quote. I booked him to arrive end of September, a whole month in advance. He had told me he was known to be "forgetful" and that I would have to re-remind about the job before it starts. Not exactly a great start! And so, a few days before the job was meant to start I received a text telling me that he could no longer make it, as he had forgot he had an eye appointment. Slightly irritating, but non-the-less, these things happen. We waited an additional week. On the day he seemed fairly knowledgable about older houses and there were lots of good things about him. But some of the major negatives included the fact he hadn't bought any kind of saw to cut and lift up floorboards. Now, I'm no electrician, but SURELY this is one of the most necessary pieces of equipment an electrician needs on a job?! Lots of the floorboards were un-nailed anyway (he got so friggen lucky!) but any that did need lifting, we had to do the job for him with our own tools. Not exactly what I had expected, but again, not the end of the world. 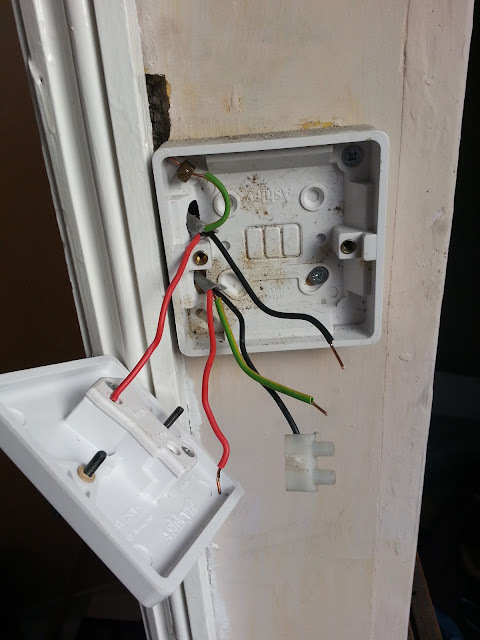 As he fitted the consumer unit, he made us aware of a number of faults on certain circuits and that to find them all would be like finding a "needle in a haystack". We ended up having the electric supply to our basement cut off altogether, only because it was much easier to do so than find the problem, which truly was only down to our very lax and laid back attitude that we probably didn't need electric down there right now anyway. I'm not so sure another customer would have been so pleased with this solution. ...And yes, those wires are live!!! (We re-connected to check) Simply HORRIFIED. Even more horrifying, we didn't discover this until more than a week later!!! No words. The final fault was in the downstairs light circuit, which we agreed would be left until the following week to be completed due to a lack of natural light as it was getting pretty late. He told us the electrics were all safe (clearly forgot about that attic light!!) and that he just couldn't issue the certificates without fixing/locating the faults. Here's where I made a major error. I paid him the full amount. I really didn't mean to, in my head I was already working out what figure I would be happy to pay him for his work today, but then he said "so we'll call it £400 (a £50 reduction on the quote) if you pay me today" I wanted to say NO WAY, but felt stupid/embarrassed/idiotic so quickly aimed the question at Grant hoping he would say NO for me. But he didn't and instead we ended up agreeing to the full amount. I should also mention that he claimed the £400 price-tag was only available so long as we didn't want to pay VAT. I hate these kind of tax-dodging scammers! If he had raised the price to £450 I can guarantee you he still wouldn't have paid his VAT on this job. We didn't pay via cash (who keeps £400 cash in the house anyway?!) so I don't feel as though I've done anything wrong here. But it definitely highlighted the fact he wasn't exactly honest/trustworthy, at least not in my books. But anyway, we waited for his return. Waited and waited. A whole six weeks later! He had a number of excuses ranging from going on holiday, to his wife being in hospital... I don't know how true these were, perhaps they were 100% honest, but in my opinion, six weeks is just far too long to leave a job you've already begun. I became increasingly worried that he was never going to return and his excuses were just attempts at shrugging us off. When he did finally arrive to finish the job, he bought a 'mate' to help - which of course, I had no problem with, until he asked before leaving "would you mind giving my mate 20 quid for his time". Calmly, Grant replied "Sorry, we don't keep paper money" and his response was a somewhat huffy "I guess I'll have to sort him out then!" and left without a goodbye, handshake or friendly smile. - Highly forgetful - including leaving live wires out! So, this company is Charisma Electrical from Lincolnshire and no, I do not recommend. We have finally received the certificates, so I do now feel massively relieved, but I'm still on the hunt for a decent electrician. Recommendations for the Nottinghamshire/Lincolnshire area would be greatly appreciated! Have you ever had a bad experience with a tradesman? Couldn't agree more! It's sooo hard to get good tradesmen! We have had a mixed bag to be honest. I have had no luck with plasterers or plumbers. I've tested the theory of whether it's about how much you pay, but both lowest and highest quotes have both produced disappointingly poor results. We found a half decent builder by luck, but he's in his late 60s so unfortunately I don't think he'll be working in the trade for too much longer. Our electrician was generally good, very accommodating to meet our programme (re-wire before we moved in but seller was messing us about with completion date), got the job done to agreed timescales, came back for follow up visit the next week to finish up, cheapest quote (just starting up on his own so not above vat threshold). The only negatives are that he hid some of his rubbish under the floorboards which we later found, and I don't think he's too keen on very small jobs. I recommended him to a friend who wanted a few sockets putting in, but he was too busy too complete the works for them. If you still want his name, PM me 😊 He's based east of nottingham. P.s. Unfortunately don't think I can now go to Newark antiques fair because of trying to get time off work 😥 but will certainly look to go in the new year sometime! Glad I'm not the only one! I've had so many tradesmen come to give 'quotes' that I've just never received. I definitely think they can afford to be picky about what types of jobs they want to do. I've often got the impression something I wanted doing was either too big/small... It's so awkward finding people! I don't really find things like mybuilder.com or ratedpeople.com help either.. No one ever replies! Ha! We don't have any works that need completing just yet, but when we do, I shall deffo message you for a contact! I also think it's a general tradesmen thing to hide rubbish under floorboards.. In both this house and our old house we found broken old switches, excess cables, used gloves, random bricks, you name it! It's like a free dumping ground. Just why? !